The 1975 smash hit Broadway musical A Chorus Line truly is a singular sensation. After winning nine Tony Awards and a Pulitzer Prize (one of only eight musicals to do so), it ran for 15 years, making it the longest running musical on Broadway at the time (it still ranks as number six). But why would this musical about dancers auditioning to be in the chorus line of a musical be such a popular success? Theater people can surely relate to it, but what about the rest of us mere mortals who've never stepped foot on a stage? The reason for its long-lasting success is that it's not just an inside look at the world of musical theater; its themes of adolescence, acceptance, figuring out who you are and what you want to be, and dedicating your life to something that you love are universal, told with raw honesty and unabashed sincerity. And the dancing is pretty terrific too. I've been waiting almost seven years for a local production of A Chorus Line, since seeing the Broadway revival tour in 2009. The Ordway Center for the Performing Arts has finally fulfilled my wish, and it's well worth the wait. 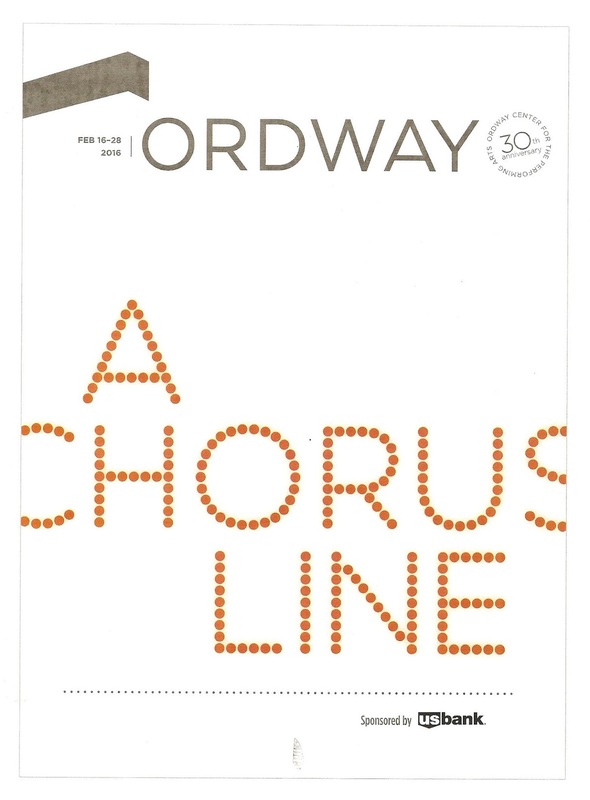 Featuring a fabulously talented cast of over two dozen legit triple threats, about half of whom are local, co-directed and co-choreographed by A Chorus Line expert Kerry Casserly and Artistic Director James Rocco, this show hews very close to the original. 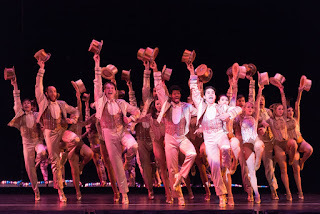 There's no re-imagining here, this is a beautifully faithful production of the singular sensation that is A Chorus Line. If you call yourself a musical theater fan, it's a must-see. The reason that A Chorus Line rings true is that it is true, or rather, it's based on stories of actual chorus line dancers in the '70s. Creator, director, and choreographer Michael Bennett, himself a former chorus boy, taped conversations with dancers that were used to shape the story. Atypical for a Broadway musical, it doesn't really have a big overarching plot or the usual love story. 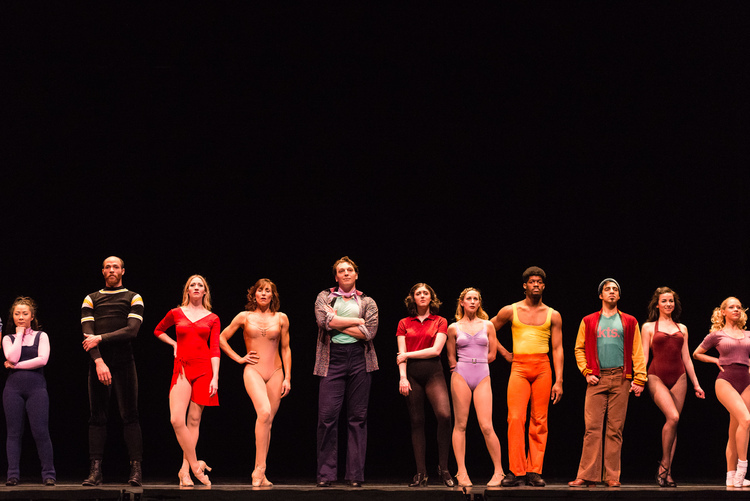 Taking place in one day at an audition, it's instead a character study of these 17 people all fighting for eight jobs on the chorus line of a Broadway show. We learn something about each one of them - their past, how they got to where they are, and where they want to go. 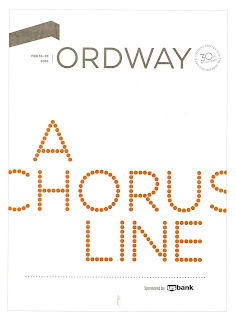 The book (by James Kirkwood and Nicholas Dante) and score (by Marvin Hamlisch and Edward Kleban) and also atypical; it doesn't follow the usual structure of 3-5 minute song followed by dialogue followed by another song. Rather the music and dialogue are organically interwoven, some songs just a line or two, some, like the "Hello Twelve" montage, last more than 15 minutes. There are funny moments (the troubles of adolescence) and heartbreaking moments (a young gay man inadvertently coming out to his parents). Perhaps the biggest character arc is Cassie, a former chorus girl and former lover of director Zach who's returning to the chorus line after trying to make it in Hollywood. But every character feels important and specific. As Zach the director, Tom Berklund (who appeared in the 2006 revival of A Chorus Line) is not only a great dancer, but he's also great as the voice of God the director coming from the back of the theater (I kept wanting to turn around and see where he was). My favorite Chanhassen (et al) dancer Tony Vierling not only plays the dance captain Larry, teaching "the kids" the steps, but he also is the dance captain for this show. "Keep your eyes on Larry," directs Zach. I always do! Broadway actor Molly Tynes brings a depth of character to Cassie, and her dance moment "The Music and the Mirror" is a highlight. Minnesota girl Maria Briggs has made a career in NYC but returns home to play Val ("Dance: Ten; Looks: Three") and charms the hometown crowd (read my Broadway World colleague's interview with her here). In the "Gimme the Ball" part of the montage, Herb Johnson III flips and bounds across the stage, thrilling the audience. Omar Garibay gives a beautiful, heartfelt, and heartbreaking performance as Paul. Katrina Asmar provides the vocal highlight in "Nothing" and the anthem "What I Did For Love." Sheila quickly became my favorite, partly because she's the resident "adult" (at almost 30 years old), and mostly because of Pilar Millhollen's portrayal of the witty and seductive exterior and the vulnerable interior of the character. Nice to see the adorable Tim Hausmann again as Mike "I Can Do That." I was thrilled to see some local faves like Andy Frye (frequently seen on the decidedly smaller stage of Yellow Tree Theatre) and Rush Benson and Renee Guittar as the sweet married couple who finish each other's sentences (both perform frequently with local theatrical dance company Collide Theatrical). I've never seen the Ordway stage quite like this; which is to say - bare. The curtain is up before the show, revealing a completely empty stage (this is after all, an audition at a Broadway theater). It pretty much remains that way throughout the show, with the exception of back panels that spin to reveal a mirrored wall, and a semi-circle of mirrors that descend from above for Cassie's dance number, providing some cool effects. The sparseness of the stage is perfectly appropriate to the setting and allows more room for the dancing (scenic design by Pittsburgh Civic Light Opera). And oh, the dancing! Michael Bennett's iconic choreography is very recognizable here, and the moment in the beginning of the show when the entire company comes together to perform the audition number they've been learning is an absolute thrill! There are many quiet and lovely moments, but the group dance numbers are definite highlights. This show makes me want to be a dancer, and I am no kind of dancer. That's how infectious this choreography, this music, this show is. It makes all of us dream of being a dancer! I must mention the fantastic band led by the incomparable Raymond Berg. I say band rather than orchestra because instead of the typical musical theater pit orchestra of mostly strings and a few wind instruments, this band includes five reeds (which thrills this former clarinetist), three trumpets, three trombones, and no strings, giving it that '70s brassy band sound, and it's awesome. Costume designers MaryBeth Gagner and Andrea M. Gross have recreated the iconic looks from the original (or at least the 2006 revival) in all their '70s glory and glittering gold. People who don't know the show might think that "What I Did For Love" is about romantic love. But it's not. It's about the love of dance. Which can easily be translated into the love of anything one is passionate about, whether it's painting, or blogging, or gardening, or running, or teaching, or delivering the mail. Whatever it is that feeds your soul and that you gladly sacrifice time, money, blood, sweat, and tears to be a part of. That is something everyone can relate to, and that is why this show strikes such a strong chord with so many people. I have three regrets about this show. 1) I was expecting a final cast bow during which I could leap to my feet along with the rest of the audience to show them my appreciation. But that doesn't happen, the lights fade on the kickline and then come up on an empty stage. If you want to give the cast a standing ovation (and you very likely will), stand up when the kickline starts. Consider this post my enthusiastic standing ovation. 2) This is only a two week run. I cannot understand why the Ordway puts together these incredible local productions and only runs them for two weeks. I'm sure it has to do with the economic feasibility and all that, but I have no doubt they could fill the theater for at least three or four weeks. In other words, get your tickets now while there are still tickets to be got! 3) I regret that I can't go back and see this show every night as I would love to do! It truly is sensational. 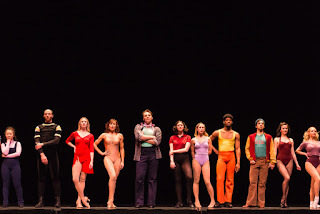 See more photos of A Chorus Line here.